My next venture is participating in an international exhibition in Milan that is running alongside the Universal Expo 2015 taking place there this summer. The exhibition is being presented byArtMeet Gallery whho are based in the city and have been running exhibitions, community projects and other ventures. THe show will take place in the Spazzio Progetto, East End Studios and runs from July 3rd- September 30th. http://www.artexpo2015.com. 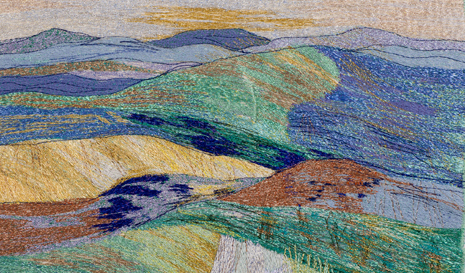 The piece I’m sending is a favourite of mine from my Irish series, called The Mountains of Mourne, so although I’ve shown it in an earlier post, here it is again. As there are only two UK artists showing from those invited. I’m pleased to see textiles taking its place amongst the paintings and sculptures! My next post will concentrate on Art in Action in July, an event not to be missed! 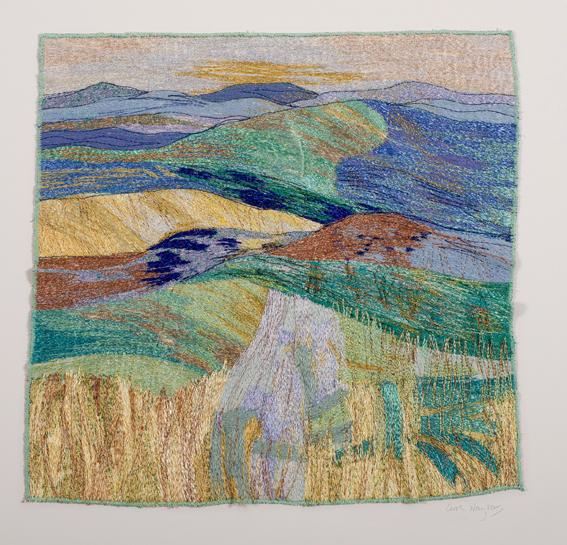 A lovely example of painting with threads – wish you a great experience at artexpo.